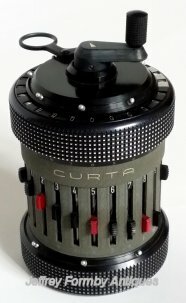 A type II Curta calculator, complete with its original plastic canister case. The underside of the Curta is marked Type II No 544342 Made in Liechtenstein (Customs Union with Switzerland) by Contina Ltd Mauren System Curt Herzstark. The calculator is sold with its original two Curta instruction manuals and original cardboard box. A type I Curta calculator, complete with its original plastic canister case. 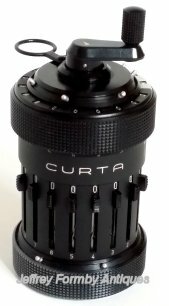 The underside of the Curta is marked System Curt Herzstark Made in Liechtenstein by Contina AG Mauren Type I No 72207.